A bottle warming apparatus for use while traveling or doing outdoor activities. 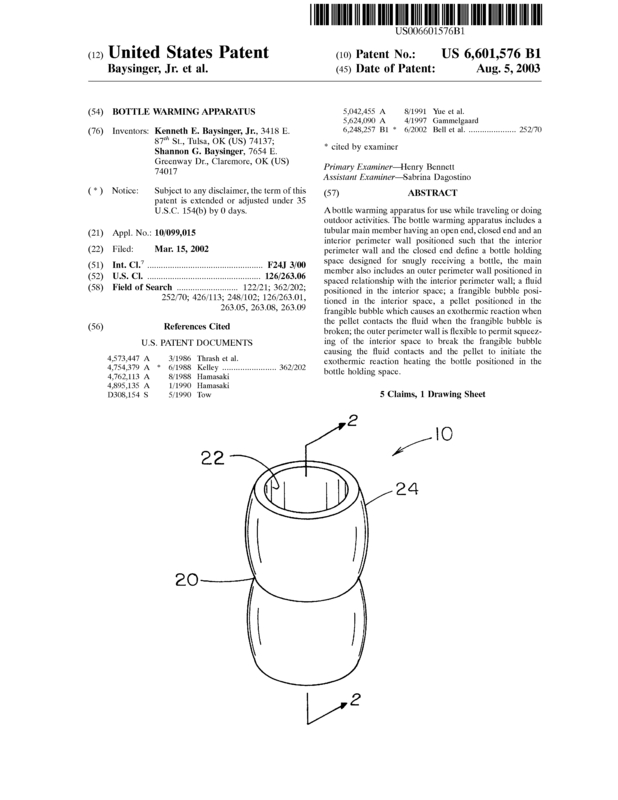 The bottle warming apparatus includes a tubular main member having an open end, closed end and an interior perimeter wall positioned such that the interior perimeter wall and the closed end define a bottle holding space designed for snugly receiving a bottle, the main member also includes an outer perimeter wall positioned in spaced relationship with the interior perimeter wall a fluid positioned in the interior space a frangible bubble positioned in the interior space, a pellet positioned in the frangible bubble which causes an exothermic reaction when the pellet contacts the fluid when the frangible bubble is broken the outer perimeter wall is flexible to permit squeezing of the interior space to break the frangible bubble causing the fluid contacts and the pellet to initiate the exothermic reaction heating the bottle positioned in the bottle holding space. Page created at 2019-04-25 0:27:45, Patent Auction Time.